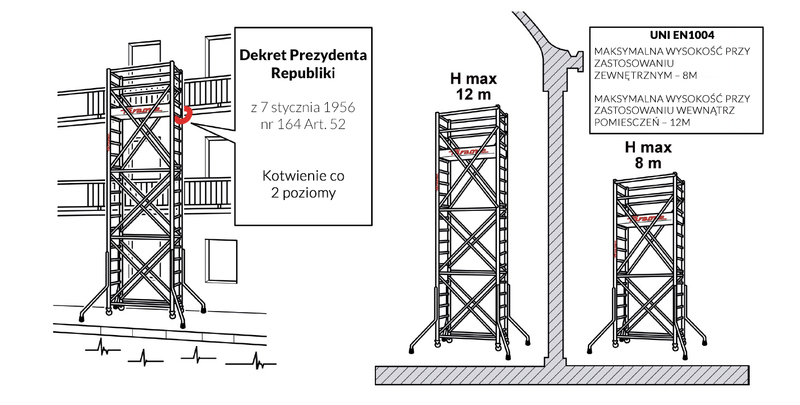 with serial number and certificate for each product, including the components of the scaffold tower. WE COMPLY WITH THE STANDARDS IN FORCE. YOU ARE EXEMPT FROM ANY RESPONSIBILITY. 2. Measures related to safety, hygiene and health during operations must never involve financial charges for the workers. 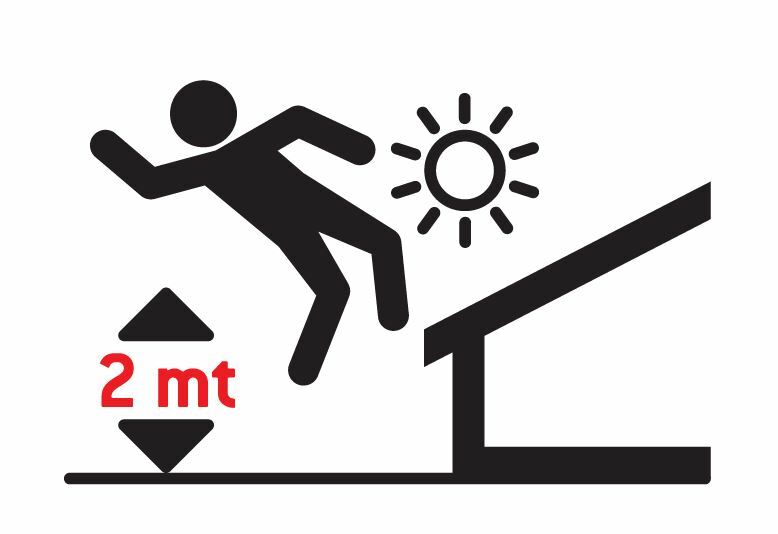 c-bis) working at height: work, which exposes the worker to risk of falling from a height of 2 m compared to the stable surface. Every product has been designed and manufactured to increase safety in compliance with the standards in force. 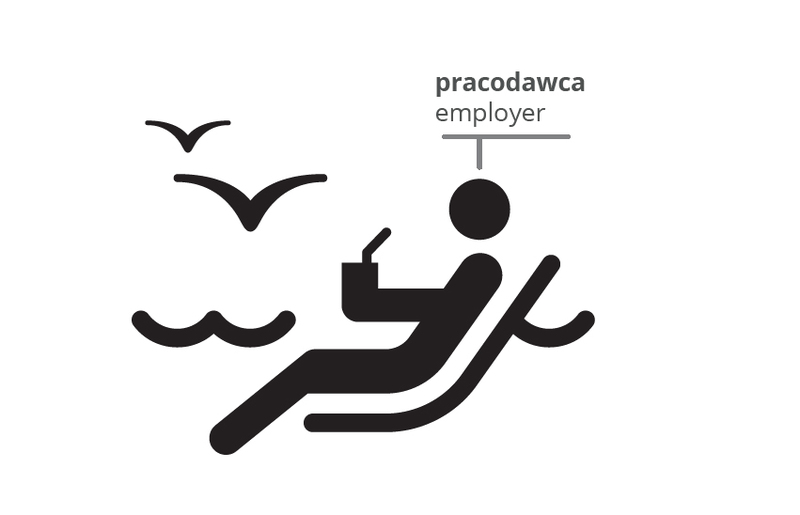 The new symbols will help you identify the most suitable product according to your requirements. 1. 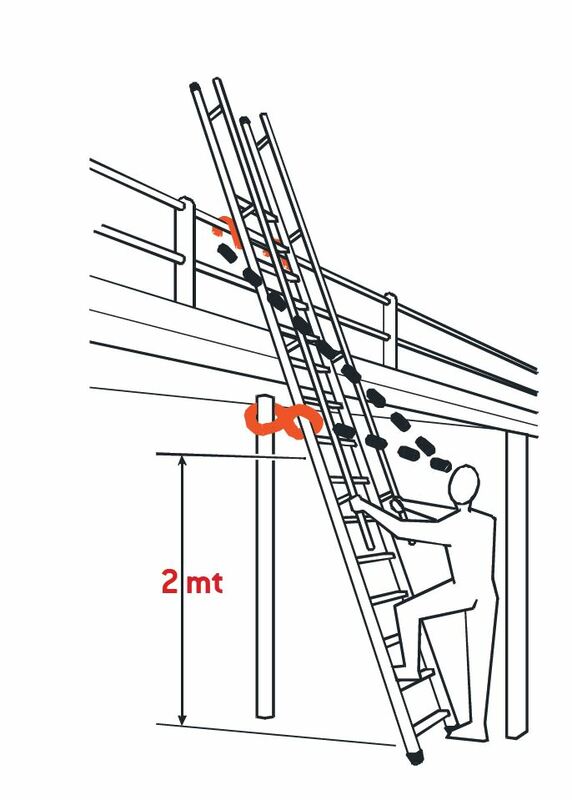 The employer chooses the most suitable access system to temporary work sites at height depending on to the frequency of movement, difference in level, and duration of use. The access system used must allow evacuation in case of imminent danger. 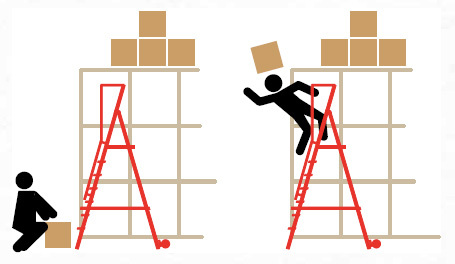 The passage from and to a platform, scaffolding, gangway access system must not involve further risks of falling. 2. 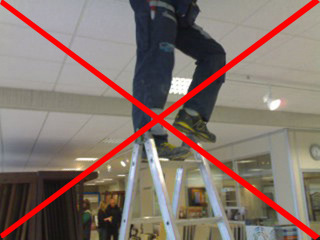 The employer provides a ladder to be used as a work station at height in the event the use of other work equipment deemed safer is not justified due to the limited level of risk and brief usage or due to the characteristics of the sites that cannot be modified. 3. 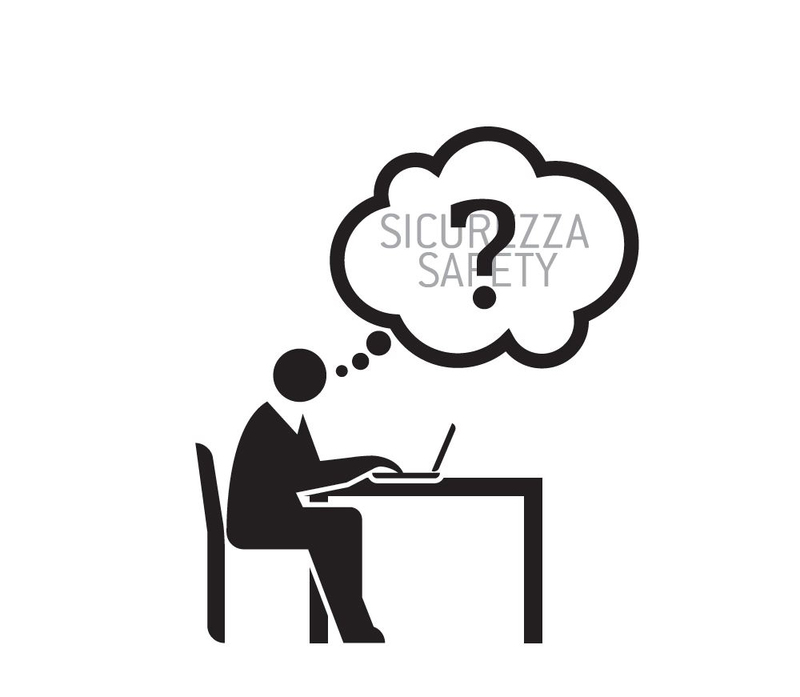 According to the type of equipment used in compliance with the previous paragraphs, the employer must identify the measures required to minimise the risks for the workers, which are related to such equipment, installing, where necessary, falling-prevention devices. 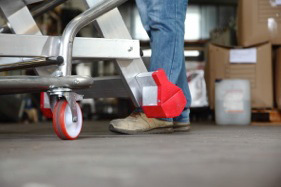 These devices must be configured and resistant enough to prevent or stop falls from work stations at height and prevent, as far as possible, workers from injuries. 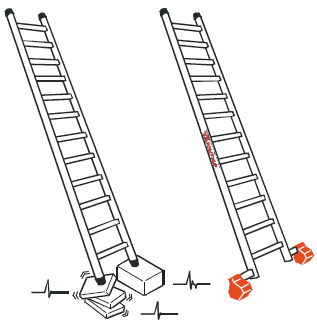 Collective protection devices against falls can can have gaps only in points where ladders are installed. 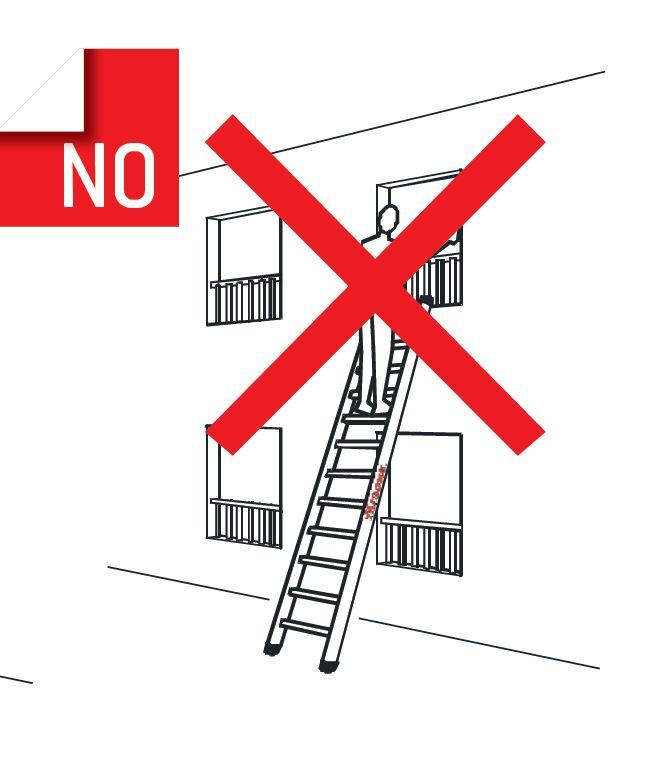 f) mobile ladders must be secured firmly before being used. 2. The employer must guarantee that workers always have a safe support and grip. 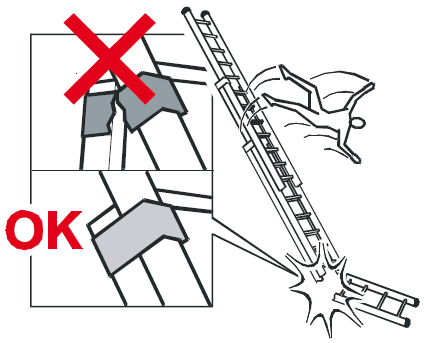 In particular, manually transporting a weight on a ladder must not prevent a safe grip. 1. 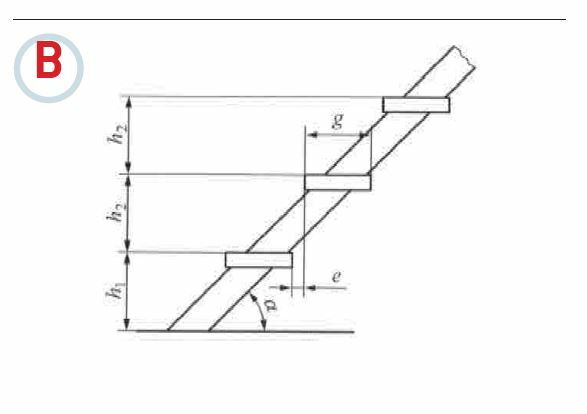 The employer must calculate the resistance, stability, and relative use configurations if the calculation report of the scaffolding chosen does not include specific structural configurations with relative use diagrams. 2. The employer is exempt from the obligation stated in paragraph 1 if he assembles the scaffoldings in compliance with chapters IV, V, and VI of the Italian Presidential Decree n. 164, dated 7 January 1956. 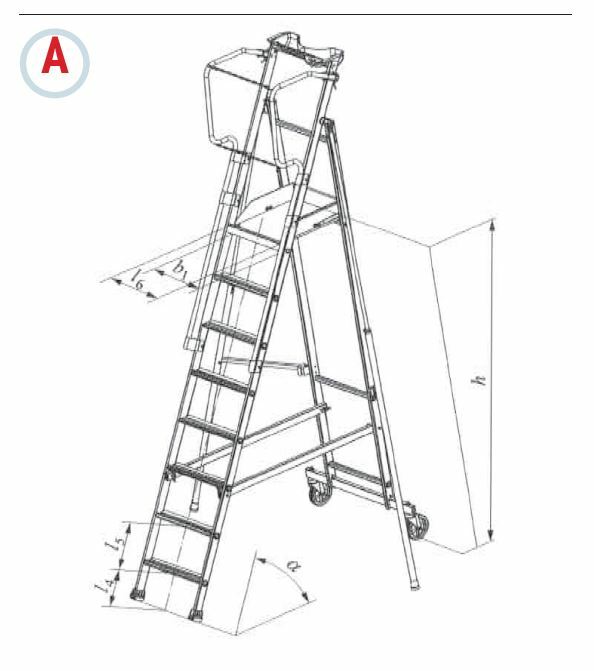 SCAFFOLD TOWER MANUFACTURED IN COMPLIANCE WITH STANDARD EN1004 AND APPROVED BY AUTHORIZED BODIES. They can be used without anchoring. For outdoor use max H. is of 8 mt and for indoor use max. H is of 12 mt. All other scaffold towers must be anchored to the wall every 4 mt. Materials with elasticity lower than 5% cannot be used. In the event of overload the ladder must not fail suddenly. “Aluminium alloy parts must have minimum fracture elongation (A) of 5%” (EN131/2 page 4 section 3.1.1). This means that any component: rungs, uprights, hinges, bases, etc., in the event of overload (see test) can «bend but not break» to protect the safety of persons and give them time to step down. WE AT FARAONE DO NOT USE THEM. 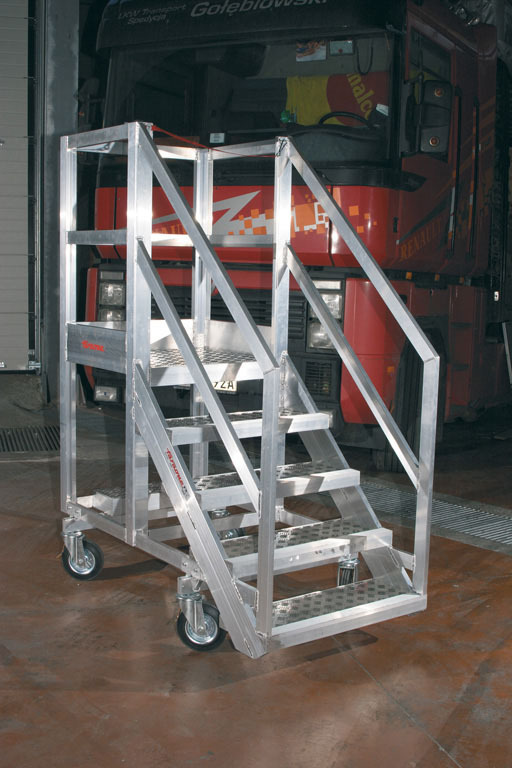 UNI EN 131-7: EUROPEAN STANDARD FOR MOBILE LADDERS WITH PLATFORM. TEXT EXCERPT FROM THE UNI OFFICIAL DOCUMENT OF THE EUROPEAN STANDARD, EDITION JULY 2013. A . Exact dimensioning of every part with the utmost attention of the totally protected work area. B . Parameters defined to establish inclination, rung, and pitch. C . Rails with exact dimensioning, which does not allow a ball with a diameter of 470 mm to pass sideways. D . Load tests on the working platform are performed with about 260 Kg. The tilting test is conducted by applying a 30 Kg lateral thrust. The test is conducted on each side. TO CONCLUDE, considering that a high percentage of injuries occurs by falling from a height, we recommend using ladders that comply with Standard EN 131-7 to guarantee total protection or using ladders with large rungs and comfortable inclination, to ensure safety and comfort. For heights exceeding 2 m, scaffold towers or aerial platforms. In addition to standard products, this catalogue describes a product, which has been conceived, designed, and manufactured for any requirement. 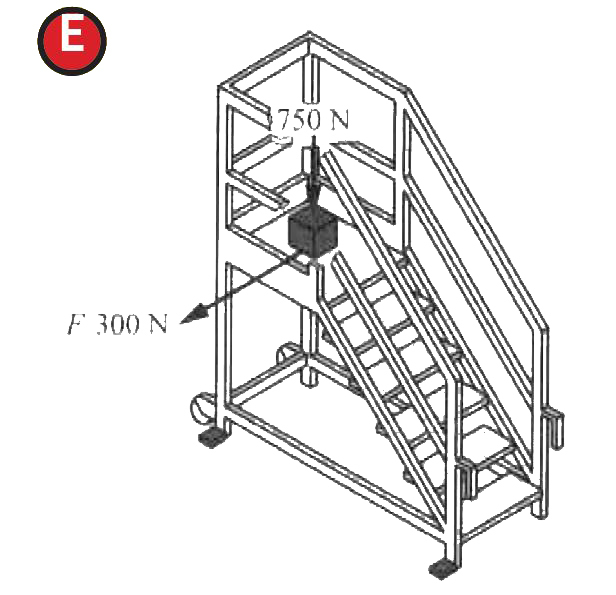 Elevah® Electrical Ladders allow you to save time as you do not need to step up and down continuously from the ladder every time you have to move position. Moreover, thanks to the Picking solution, the goods or work equipment are always at hand and safe. Fatigue, falls, distortions, absences from work due to injuries, etc. 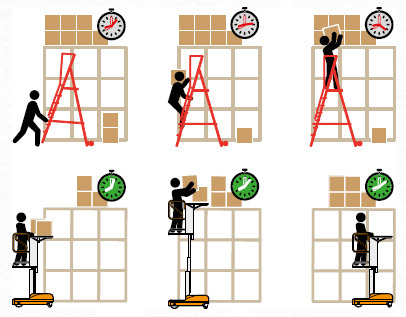 With Elevah® Electric Ladders many of these problems are solved. A work station where you do not have to step up and down continuously, but everything occurs safely and comfortably. Why having two operators when the same operation can be performed by one single person? 50% saving immediately, the best way to reduce costs and boost your morale and your business. Easy to displace and handle, thanks to its compact dimensions. This reduces work times and risk of accidents. 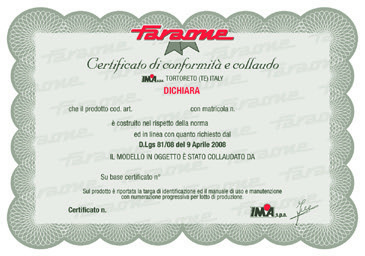 Faraone patented device for safety of the ladders during movement and use. The brakes on the ladders on wheels must be engaged before use. 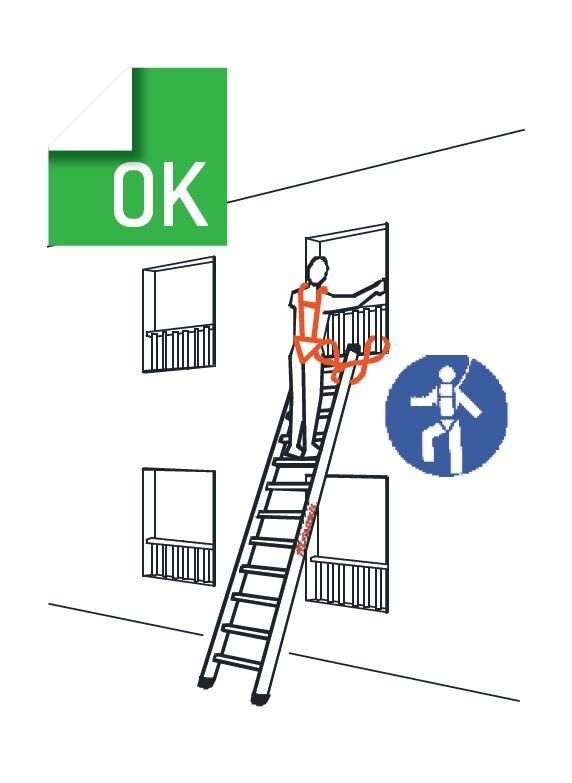 ENGAGING THE BRAKES ON THE LADDER IS LEFT TO THE OPERATOR’S DISCRETION, WHO IN MOST CASES DOES NOT PERFORM THE MANOEUVRE. 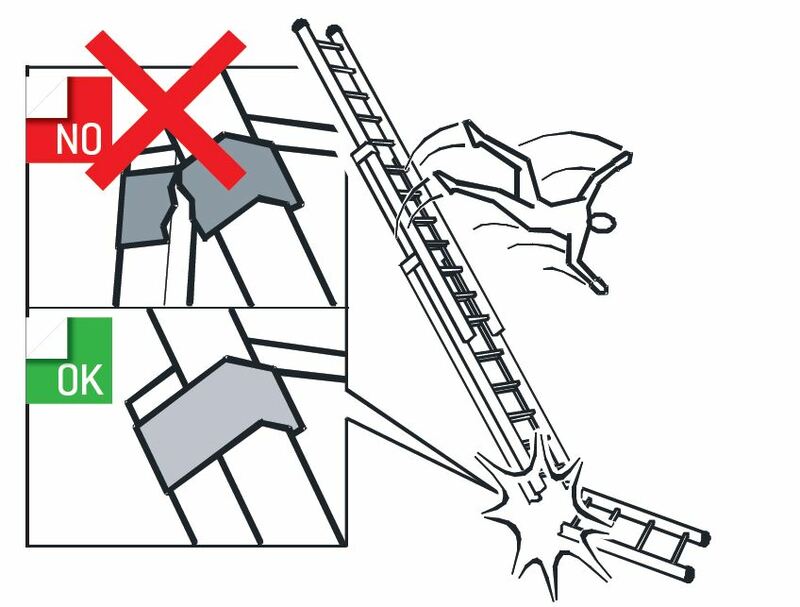 USING THE LADDER IN THIS WAY LEADS TO A SERIOUS INJURY HAZARD, GIVEN THAT THE LADDER IS UNSTABLE. 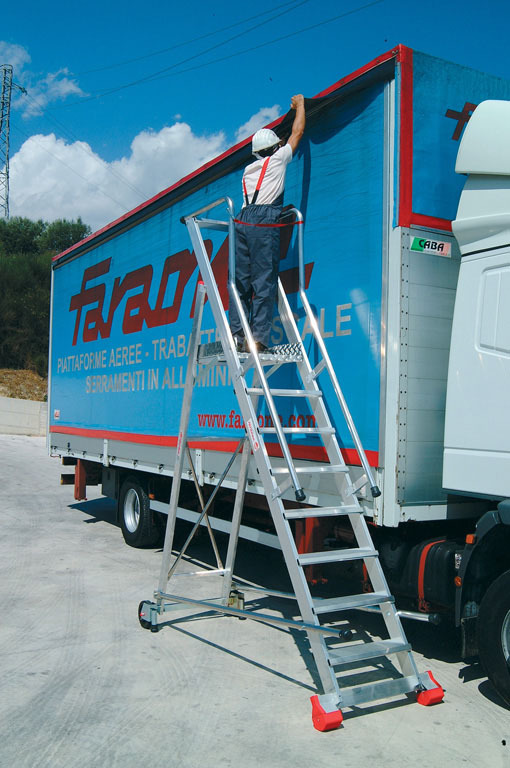 To solve this problem, Faraone has patented SICUR STOP; a lever system that lifts the ladder to activate the wheels and be moved. 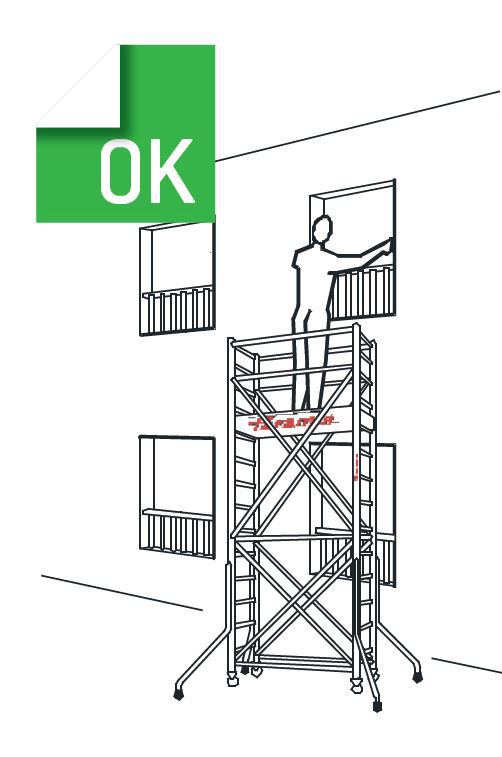 THANKS TO THE ANTI-INTRUSION BAR, in this phase the operator cannot access the ladder. 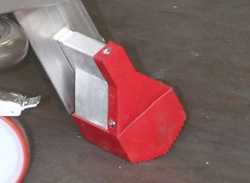 By taking the lever to the rest position, the wheels retract and the ladder rests on the solid stabilizer bases. 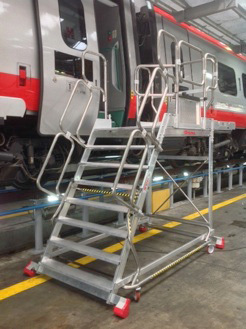 SICUR STOP CAN BE MOUNTED ON ALL ROLLING LADDERS PRODUCED BY FARAONE. 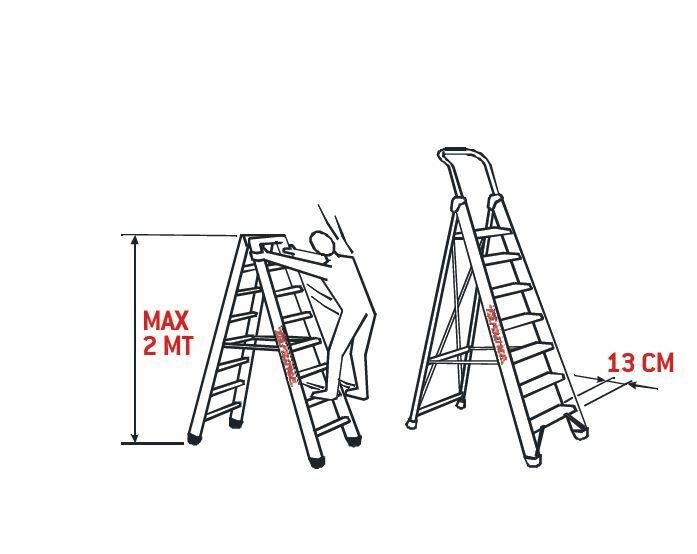 To give maximum safety and comfort to a ladder, the step must be as deep as possible and have inclination that allows comfortable climbing. 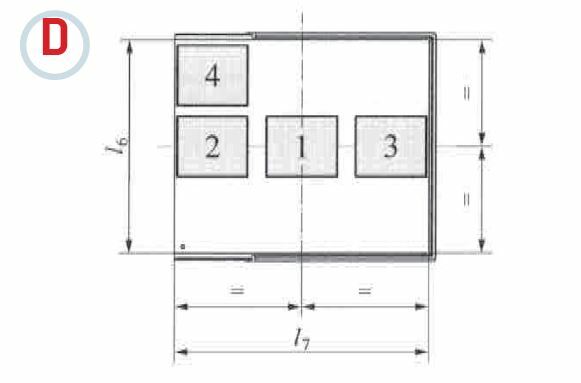 In this case, the Standard envisions a minimum step of 8 cm. 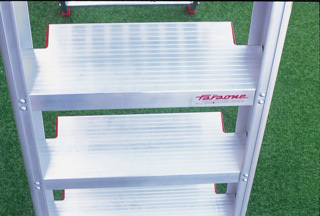 Faraone has a wide range of ladders with flat steps measuring 13, 15 and 30 cm with climb inclination of 60 and 45 degrees; the more the ladder is inclined, the more comfortable the climb. 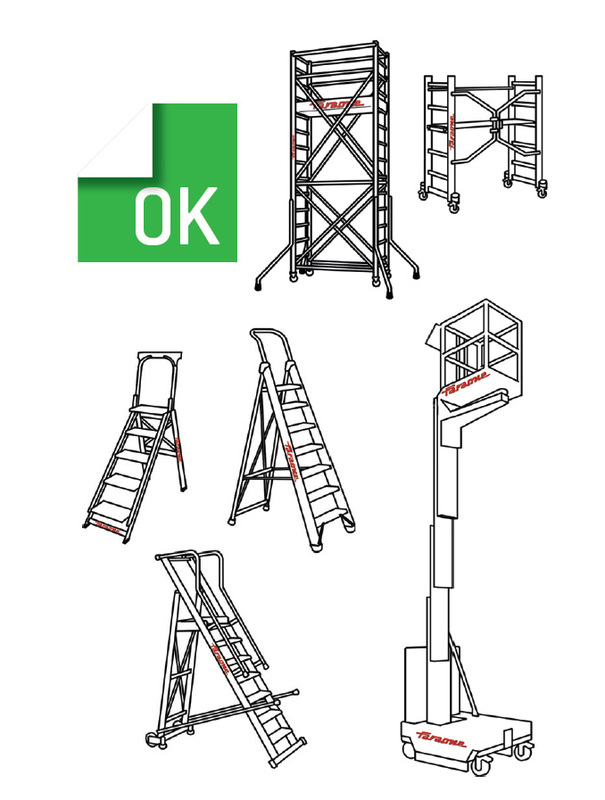 The ladder models that benefit from this innovation are: smt, mft, smft, mag, spf, sag ,sge, domus, sgp, teles tt, cm and all models in the special line. Multi-purpose telescopic ladders are very handy thanks to their versatility. 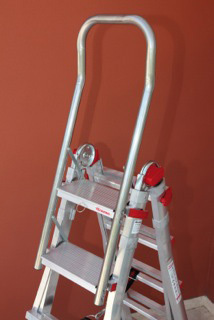 They can be used as an extended ladder or in the scissor position or adjusted for use on stairs. However, they hide several hazards during use regarding operator stability, as the rung is only 3 cm deep and there is no protection in the upper part. 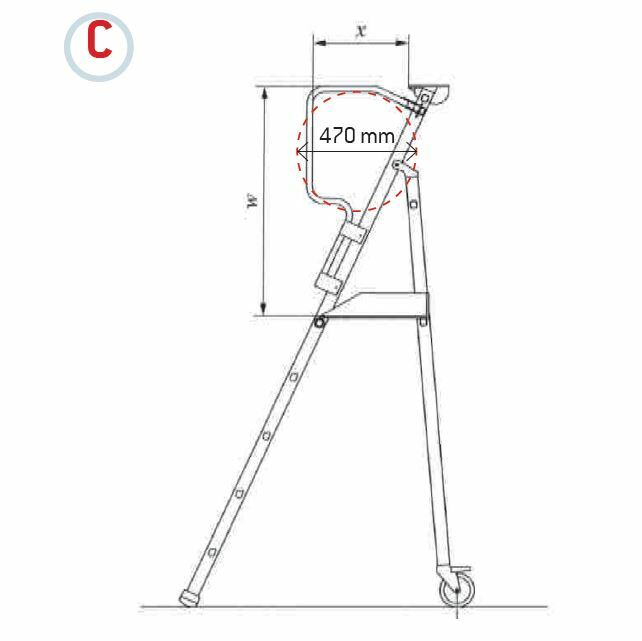 In order to offer the maximum safety possible, Faraone has patented a removable handrail and a step measuring 15 cm, which the operator can position in the point he is working, offering a safe grip and great comfort underfoot. 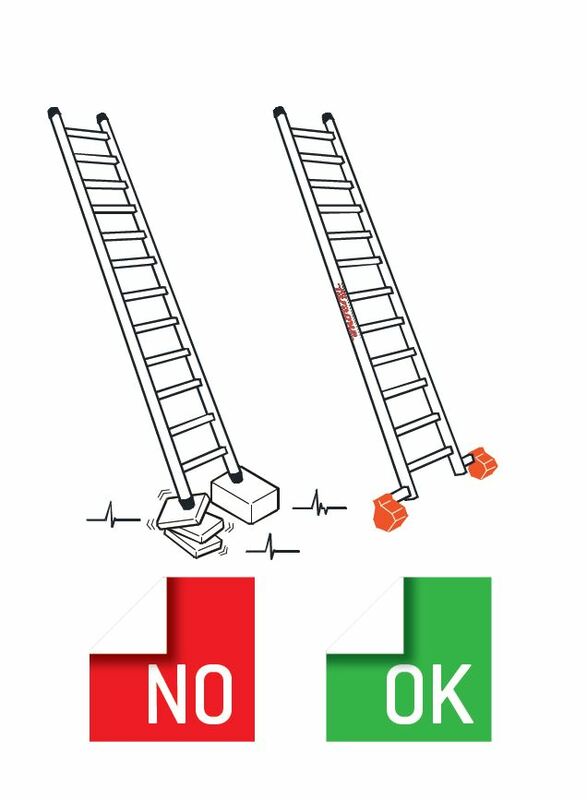 To guarantee long-lasting ladder stability, a fixing system that ensures the ladder does not move over time is essential. 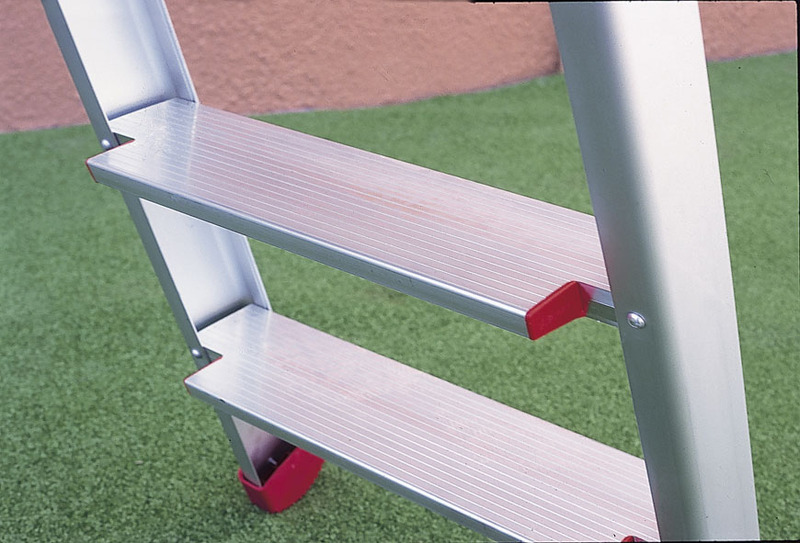 Rivets are commonly used to fix the double-sided ladder flat steps, but even if this solution is widely used, it creates problems with loosening and safety hazards after only a short time. Another solution is to weld the aluminium parts, but this solution also creates problems with resistance to fatigue and after just a few years the ladder may have to be thrown away. 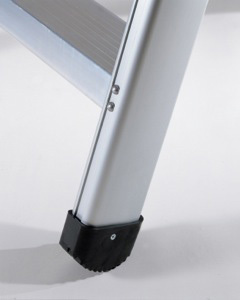 Faraone has invented a fixing system with aluminium expansion rivets that ensure the ladder does not move over time, without weakening the structural part of the ladder. This solution is normally used to assemble parts of an aeroplane. The following models benefit from this innovation: teles tt, lady, domus, nd, ndl, sella. For Faraone, all structural parts where personal safety is at stake must have features that bend but do not break if overloaded. When a component on a ladder bends, the operator suffers no harm and on changing the damaged component, the ladder is as good as new. 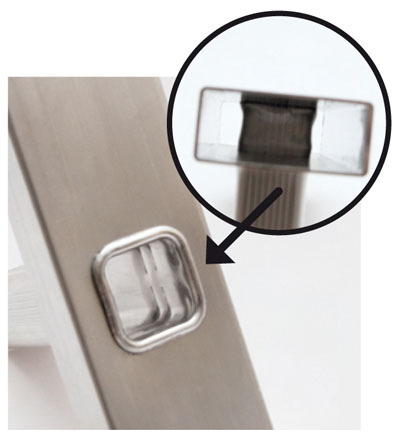 If vitreous components are used, such as die-cast aluminium elements, they can suddenly collapse, with serious injury to the operator. Regarding this, take a look at the video comparing die-cast aluminium articulations on the market and the Faraone moulded steel articulation. The entire Faraone range benefits from this essential safety feature. 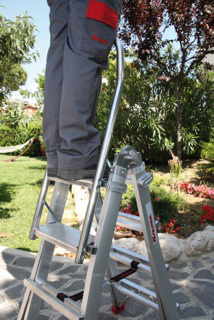 Italian Legislative Decree 81 indicates that leaning ladders must be fixed before being used. 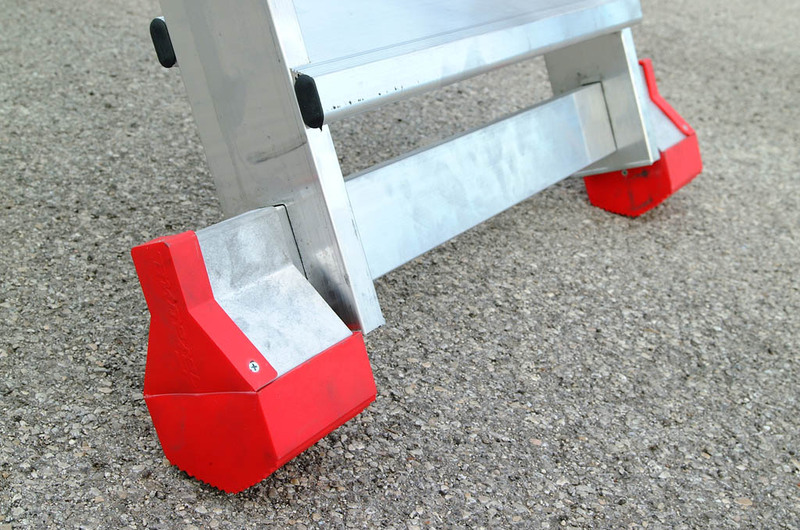 Faraone deems that in order to offer the operator the greatest possible safety, the first step is to have a base that slips as little as possible. This is why it has patented a large twin-component base with an extruded aluminium core and a thin part in slip-proof soft plastic. 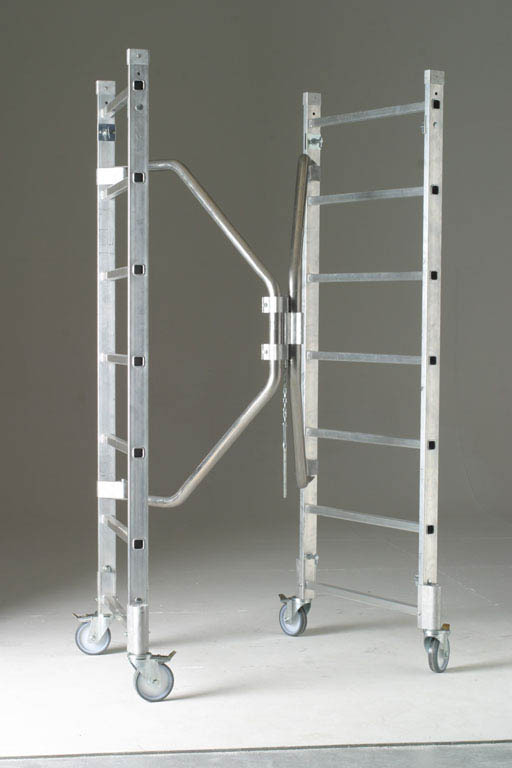 This system guarantees large and safe leaning, meaning every type of ladder is highly stable. The models that benefit from this innovation are: smt, cm, 150 range, 200 range, mft. 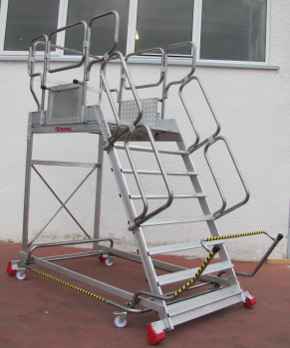 As another safety feature, Faraone’s standard offer includes belts to anchor extension ladders to the leaning point. All rungs are riveted with a 16-point high-power hydraulic expansion system which presses the rung to the upright in 16 different places guaranteeing its long-lasting stability. Faraone also uses rungs with 30 x 30 sections for the 150 range and 35 x 35 rungs for the 200 range, unique in its category. 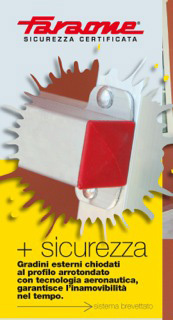 A 28 x 28 rung is sufficient to comply with the EN 131 Standard, but Faraone goes beyond. The uprights used by Faraone have a thickness measuring 1.2 to 2.5 mm, therefore exceeding the 1.2 mm required by the EN 131 Standard. Faraone has designed its mobile scaffold towers to make them intrinsically safe; starting from the closable base that allows quick and safe assembly of the same. This is impossible for iron scaffolding with its 40 kg base; that in aluminium weighs a mere 12 kg. 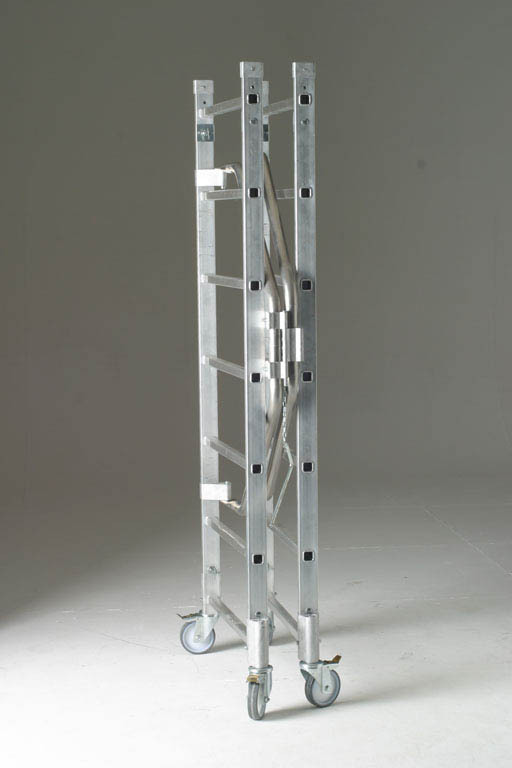 The use of aluminium, which is highly resistant and light-weight means it is much easier to mount a side piece weighing 7 kg than an iron side piece of scaffolding weighing an average of 16 kg. Faraone aluminium scaffolding has an average of 50% less components than iron scaffolding, meaning enhanced safety and lower cost. We believe that Faraone scaffolding equipment saves time, fatigue and money, providing the best safety features in the category. The work surfaces have an aluminium structure and phenolic wooden surface, weighing less and lasting longer. 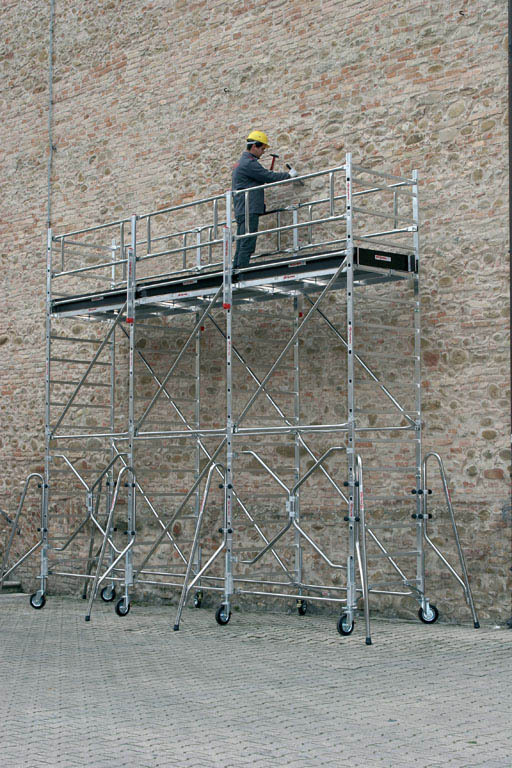 Faraone mobile scaffold towers are the only scaffolding approved by ISPESL and that comply with EN 1004 Standards, which allow use without anchoring. CCS, lifting chains control system, allows to have the lifting chains, an essential part of the aerial platform always under control. In the case of wear, the system communicates that an overhaul is required, thus avoiding the necessity for periodic chain control.